Named one of Bustle's "13 Motivational Books By Women to Read if You Need a Little Bit of Life Coaching"
AMBER RAE is an author, artist, and speaker devoted to inspiring people to express the fullness of their gifts. Her writing blends raw, personal storytelling with psychology and neuroscience, and has reached more than 5 million people in 195 countries. Her public art has spread to more than twenty countries and she's spoken to and collaborated with brands like Kate Spade, Apple, Amazon, and Unilever. 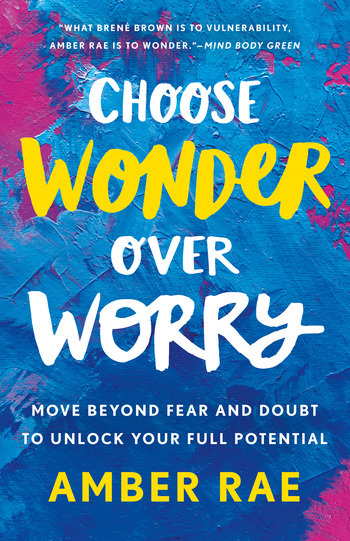 Fortune said her work is "determined to help people tap into their creativity," Forbes said it "helps people follow through on their ambitions," and Mind Body Green called her "The Brene Brown of Wonder." She's been featured in The New York Times, TIME, Fast Company, BBC, ABC World News, Tim Ferriss's blog, and more. Previously, Amber helped launch six best-selling books as Chief Evangelist of Seth Godin's publishing experiment and started an "accelerator for your life" called The Bold Academy. Amber is the author of Choose Wonder Over Worry. She lives in Brooklyn and around the world.